The Canadian Arcade reviews Dialed IN! Reviewed at YEGPIN 2017. Includes gameplay and glass-off tour of the game’s features. 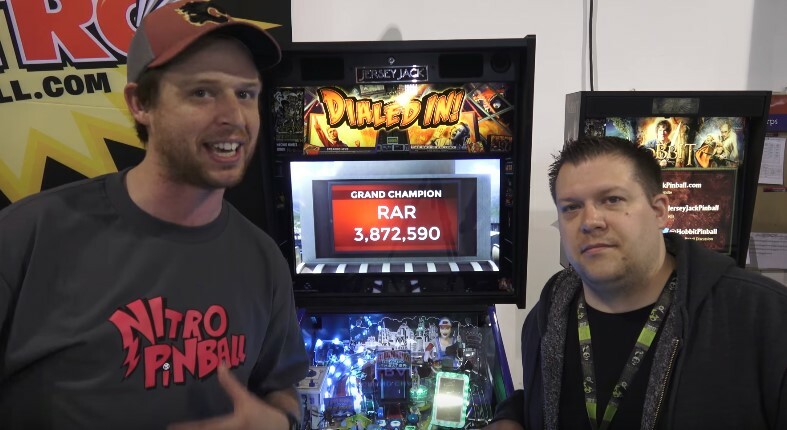 We get an opportunity play a few games on Jersey Jack Pinball’s new Dialed In. Pat Lawlor worked on this title for nearly 2 years, citing when it was announced that he was joining the Jersey Jack team that he would have creative freedom again like he did back in the Williams days. This third title for Jersey Jack would be the first standard body game, yet packed with features like Lawlor’s titles often do. This theme sort of ties into his existing whirlwind and earthshaker themes as a disaster city, but this time updating it to modern times where a rogue cellphone begins causing the havoc. This game features a hologram that is similar to the premium/LE Stern Ghostbusters. It also has a built-in camera that takes selfies during the game. Lastly, it also has Bluetooth that can pair with a phone, and allow the player to control the flippers remotely, a first in pinball.